We've got all sorts of useful shape printables here to use in the classroom or home. Print and enjoy with the kids! You can find ideas for using our useful shape printables here. These large flashcards show a circle, square, rectangle and triangle and print 2 per page. You can extend the set with more shapes here. These small 2D shape flashcards feature 12 basic shapes and are great for one-to-one work or to have on the table. These 2D shape vocabulary matching cards can be cut out individually and used for matching games like pairs, or cut out along the horizontal lines only, folded and glued together to make the name on one side and the picture on the other. 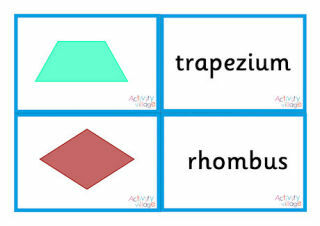 There are 25 words in this set of word cards, a combination of the names of 2D shapes and some shape related vocabulary. This set of flashcards prints 4 to a page and shows the sphere, cube, cuboid and pyramid. Use these sorting mats with "real" objects such as wooden bricks or our photographic 3D object cards, or for drawing or cut-and-pasting appropriate objects, perhaps from old magazines. This collection of word cards covers a full range of 3D shapes, from sphere up to dodecahedron! We've also included some of the language you will need when describing 3D shapes. Use these word cards for display or for matching activities with our 3D shape flashcards and posters. This slideshow has many "real world" examples of spheres, cubes, cuboids and pyramids to show children. Slides progress at 10 seconds to allow discussions of the pictures, but you can advance quicker if preferred by left clicking with your mouse. We have 4 sets of photos of "real life" 3d shapes here - the sphere, cube, cuboid and pyramid. Use them as they are as posters, or cut out and sort them - perhaps using our 3D shapes sorting mats to do so. Use these printable vocabulary matching cards as double-sided flashcards (simply fold down the centre line before cutting out and glue back-to-back) or as a matching activity for the kids. 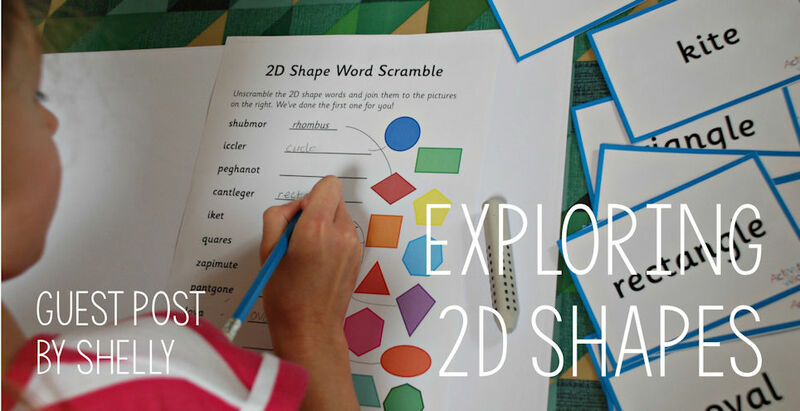 So you can find the level that is right for your children, there are 3 versions of our "label the 2D shapes worksheet" to chose from: blank, with first letter clues and as fill in the missing letters. Print this set of 4 large shapes to cut out - in colour or black and white. This set of large shape printables includes 14 shapes in bright, appealing colours and with a good solid outline for cutting out. Use them for counting sides and corners, manipulating etc. We've also included a black and white set. These bright posters are an excellent aide-memoire for children learning about the first 3D shapes. This set comprises a sphere, cube, cuboid and pyramid. These big, bright posters are perfect for display and provide a summary of the properties of each of the 4 shapes included. We have provided sets with different vocabulary so that you choose which you prefer. You can use this set of 11 shape sorting mats with our useful shape printables or your own shapes. Sort our useful shape printables or your own shapes onto these 4 mats for circles, squares, rectangles and triangles. There are so many ways you can use this set of 10 circles - which comes in colour or black and white. Familiarise children with the surprisingly satisfying shape of the heptagon with these printables! We've got a colour version or black and white, each comprising 10 graduated shapes. Print hexagons in colour or black and white, in 10 sizes. Useful for all sorts of learning or crafty projects! Print out 10 colourful or black and white octagons, sized to stack from small to large. Print out 10 useful pentagons from tiny to large, in colour or black and white. This set of 10 rectangles comes in different sizes so they can be used in lots of different ways! Colour and black and white available below. Are they rhombuses and rhombi? Neither sounds right! There are 10 rhombuses in this printable, in lovely candy colours or in black and white. Here are 10 semi circles growing from tiny to large, sized to fit in with our other useful shape printables! Choose from colour or black and white below. Print out our useful squares - all 10 of them - in colour or black and white. There are so many ways you can use them! Here is a set of 10 stars, increasing or decreasing in size by 10% each time. Choose the colourful version or the black and white. Print out our 10 "stacking" triangles in colour or black and white and use them for all sorts of learning or craft activities. Our Useful Shape Printables come in 10 sizes and colours, or in black and white. If the largest shape is 100%, the next shape down is 90% and so on down to 10% for the smallest.